Chinese science fiction is still a relatively new concept for Western readers. It is not so in China. An encounter during my trip to China earlier this year vividly illustrates domestic attitudes to science fiction. While browsing in a major national book shop, I asked the assistant where I could find the science fiction. She directed me to one end of the shop, where I found children’s literature and educational books. Baffled, I returned to the assistant and inquired again, providing an example of the sort of books I was looking for. “Liu Cixin’s Three Body? Oh, why didn’t you say so before? !” I was re-directed to a section at the end of a row of shelves where, albeit small, I found the selection an elegant sufficiency to keenly pique my interest. Although this is changing rapidly, in China’s past, science fiction had, for quite a long time, associated with children’s literature. This might have been partially connected to the immensely popular children’s encyclopaedia, “100 000 Whys”, perused by generations of children in the latter part of the twentieth century, all over the country, which contained a very fun science section. Among its many authors was Ye Yonglie, one of the masters of early Chinese science fiction, who skilfully combined the genre with children’s literature. The result was one of his most influential and enduring works. As today is International Children’s Day, which has long been much celebrated in China, I am sharing with you an extract from my “The Chinese Don’t Do Sci-Fi? !” talk. This is the section on Ye and his timeless Chinese children’s classic. As one of the authors of “100 000 Whys”, a science periodical for children, he was able to correspond with many of his young readers. Articles from this publication were later collected and published as a series of books, which I fondly remember reading as a child in the 80s. In 1961, Ye wrote his most famous work, the hugely influential children’s story “Xiao Ling Tong Roams the Future”. As Ye states in the prologue, this was the result of the hundreds of letters he had received from young readers all over China, enquiring about the future. Xiao Ling Tong is a teenage photography fan who helps out the local news press, carrying his notebook and camera wherever he goes, ready for the next scoop. One day, Xiao Ling Tong loses his camera, and in his search for it, finds himself accidentally on a time machine, bound for Future City. Xiao Ling Tong is invited to stay at the home of the ship’s captain, where he lives with his grandchildren, Little Swallow and Little Tiger and their house robot Tie Dan (literally “iron egg”). The 1950s and 60s were a time of great technological advancement, Western commercialism thrived on bringing eager consumers the latest coveted gadgets to their homes. Ye’s story reflects this trend, and the daily life of this future family is a picture of technological marvel, comfort and sophistication. Some of the tech are a wonder even for readers today, such as weather control, artificially produced rice and protein that are more delicious and nutritious than the real thing; the Qu Wu You, a substance used to coat all utensils, clothes, and also in cosmetics, so that dishes and clothes hardly need washing and one can keeps dry in the rain. Others pieces of tech, which feel familiar to us today, like genetically enhanced foods, VR movies, e-books, pocket devices that act as radios, phones and televisions, show just how close some of the author’s predictions were to the real future. From the presence of the five star flag on the ship, to the Chinese meal Xiao Ling Tong is treated to by his host, to the new inventions in porcelain production, we can see that this is very much a vision of a future China. The story is told first person by the child Xiao Ling Tong, who is lively and full of open wonder. Although a children’s story with a simple plot, it’s one of my favourite, as a charming story and a rare glimmer of optimism within the genre. When Xiao Ling Tong visits the library with his friends in Future City, he comes across a history of the city, with this line written on the first page. Little did Ye Yonglie know that the following decade would wreak so much destruction upon China’s heritage and its people’s already frail confidence. Once again, there was no room for science, and life was far more harrowing than fiction could imagine. 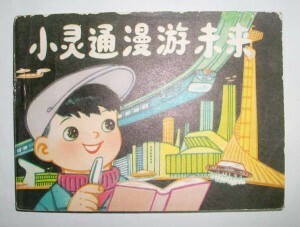 “Xiao Ling Tong Roams the Future” was only published after the Cultural Revolution in 1978, and inspired a whole new generation of children, it sold 1.6 million copies.